We really mean it when we say "Dine on the wild side of Mother Nature!" Ingredients: Wild sulfur shelf aka chicken of the woods, lion's mane, black trumpet, Lactarius indigo, commonly known as the indigo milk cap, and shiitake mushrooms, wild leeks ("ramps")* and sea salt. It doesn't get any wilder that that! All the wild mushrooms are wild harvested by a mushroom expert. The shiitake is the only commercial ingredient in this rub. We may add other wild mushrooms at a later time if they become available. We may add chaterelles, hen of the woods, cauliflower and/or wild oyster mushrooms. Ingredients list will be noted with the new additions. Check back for new additions. Price: $25.00/each bottle or two for $45.00, plus shipping. Email for information or to order. Lightly coat your meat with olive oil or moisten the meat with water (not totally wet), sprinkle the rub over both sides, and cook. If you like a sweeter version, simply add a little sugar or sweetener to taste. Our wild mushroom meat rub powder can also be added to soups, stews, vegetables, or any recipe that you would like to add it to for a flavorful addition. Total weight of bottle 4.6 oz. Empty bottle weighs 3.4 oz. Product inside bottle weighs approx. 1.2 oz. and is in powder form. *Wild leeks/ramps has a garlic/onion flavor. Berries for seasoning should be picked on a day that is dry and sunny. Damp or wet berries will have a sour flavor. Pull berries off twigs, getting only the berry and not the small stem. Put pile of berries in a blender and blend for 1-2 minutes. The seeds will fall to the bottom. Take out the seeds and scrape the red berry pulp from the sides of the blender, and put into a spice container. 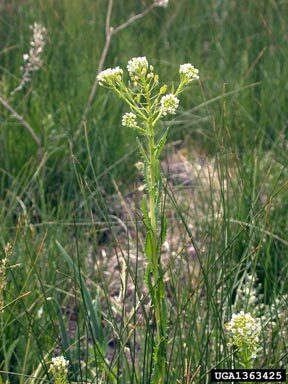 Penny Cress / Pennycress (Thlaspi perfoliatum) - seasonal fresh; dried available - Email to order - In stock! Check out their sausage recipe! Wow! Young leaves - raw or cooked. Bitter to sweet taste and aroma. Added to salads, cooked in soups or used as a potherb, they taste somewhat like mustard but with a hint of onion. The seed is ground into a powder and used as a mustard substitute. The seed can be sprouted and added to salads. Young leaves - raw or cooked. A hot cress-like flavor. *Caution - White and Yellow Sweet Clover -Dried leaves can be toxic though the fresh leaves are quite safe. This is due to the presence of coumarin, the substance that gives some dried plants the smell of new mown hay. Taken internally it can prevent the blood from clotting. We reserve the right to refuse to supply any company or person for any reason. In order to comply with USDA food safety regulations, we do not sell nor provide anything containing meat, poultry, canned low acid foods, or dairy products. We sell herbs (plants) for a novelty, religious, or food supplements only.